Yesterday I received an email from a long time friend, Sandra. She included the photograph that you see posted here. 15 years ago Sandra’s husband, Wes, and I were on a plane together. The day was 9/11. When those planes were going into the towers in New York, into the Pentagon, and it into that field in Pennsylvania, Wes and I were in the air. We made our way that day to Singapore, to Ho Chi Minh City, Vietnam, and finally to Phnom Penh, Cambodia. We heard the initial reports that over 10,000 people had died. Those numbers were later revised to be more than 2,900–-2,996, I believe. Still, it was devastatingly horrible. 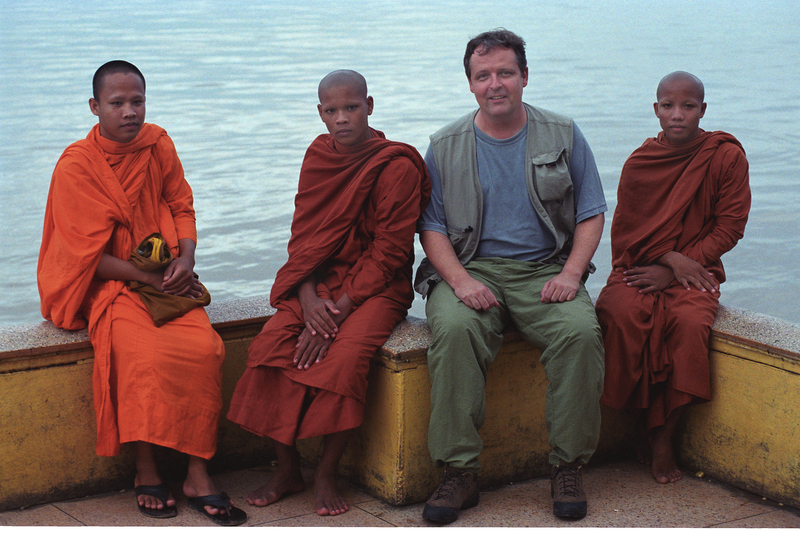 We stood out as Americans in Cambodia. And we had an experience that I’ll never forget. People from many nationalities came up to us and spoke words of kindness and comfort. The first to do so was an Irish family visiting Cambodia as tourists. Perhaps the most moving moment was when the young men – Buddhist monks – in this photograph approached us. They did not speak English, and we did not speak Khmer, but they wanted to express their condolences. They actually handed some flowers to Wes and me, and bowed their heads. Channeling my best charades skills, I asked if they would mind being in a photograph. They smiled and obliged. It just so happened that Wes was a noted photographer, and he quickly took the shot you see here. Wes passed away almost a year ago after a long and difficult battle with ALS. As with the death of anyone, many wonderful stories passed away, too. Several thousand passed away in the events of 9/11. As Wes and I visited the Killing Fields later that day, we were reminded that several million stories had passed away in the late 1970s with very little response from the rest of the world. Wes’ skill as a photographer still jogs the memory of those of us who were around when he was applying his craft and practicing his art. The people with whom we share significant moments of life – especially signature events like 9/11 – are always part of us and our story. The viewer doesn’t see Wes’ story in this photograph, so that’s why I tell it. The story you do see here is one of compassion and care and the bond of common humanity. From that day to this, I’ve chosen to remember not only the destructive acts of terror on 9/11, but I’ve also chosen to remember the life-giving acts of friendship that I experienced. Our languages, our ethnicities, our religions were different. But in what was a time of shock and grief for me, these young men offered some solace. Our humanity was the same, and that’s what mattered. Orienteering is an activity that requires navigational skills– usually a map and compass– to navigate from one point to another across unfamiliar terrain. On our college campus, just like most campuses across the nation, we offer several days of “Orientation” to give our incoming students and their parents a map and compass for what lies ahead. When new students arrive on campus, many of them bring a strong sense of where they are coming from. This is important, because their identity is wrapped up in place and people. It’s part of what makes them distinctive, and it’s part of the gift they will add to our campus community. It is important to know where you’ve been. It’s also important to know where you’re going. That’s why we spend hours– even days –acquainting students with the campus, it’s building, its services, it’s people. Our hope is that they will soon feel at home here, but we know that takes effort. The fact is, this isn’t home – at least not yet. There are people here from a variety of backgrounds, points of view, family situations, regions of the country and the world, religions, sexual identities, political backgrounds, and orientations toward life. And they are all here to journey toward an education, toward preparation for life, toward wisdom and a sense of what is just, an understanding of what is right and what is good and how they can contribute toward these ideals. They are here to continue to shape themselves into the people they wish to be. College is a four-year, intensive engagement in that shaping. They will go to places they’ve never been, and journey down roads they have never traveled. They need maps. “Are you sure?” asked the mountaineer. “I’ll be here in the morning,” said the mountaineer. “No thank you. We have the map.” they replied. Students experience fog when they are at college. That’s why they are provided not only maps, but guides as well. Guides are faculty and staff, residence hall advisors and teammates, chaplains and counselors and coaches. These people offer companionship through the fog, and then send the students on their way when the visibility is clearer. Colleges are in the business of orienteering.